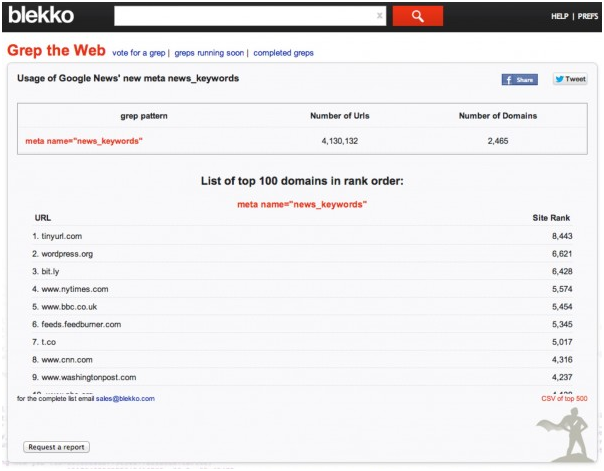 Back in September of 2012, Google launched a new meta tag entitled “news keyword meta tag”. The purpose of this meta tag is to provide news publishers with a better method of ranking keywords they might not have been able to include in their headlines. How many news publishers have adopted this new tag so far? The answer? Only about 5%. When asked directly by several sources how many publishers were using the new tag, Google declined to comment. However, a rival search engine, called Blekko, has trolled through millions of webpages to compile data regarding which pages are utilizing the new tag. They recently released a report compiling all of their data on December 21st, 2012. It was discovered that only 2,465 domains were employing the use of the tag. The tag is only going to work for domains that are within Google News, so if you can locate the number of sites within Google News, the figure can be calculated to provide an estimated adoption rate. Fresh stats about Google News were recently released by Google in September. According to these figures, there are more than 50,000 sources within Google News. Dividing 2,465 domains by 50,000 sources is going to provide one with a 4.93% usage rate. We just rounded it up to say 5%. There are a few caveats that are going to need to be taken into consideration. The search engine Blekko covers approximately 4 billion webpages. It is estimated that Google covers 10s of billions. (The search engine refuses to divulge exact figures. ) It is logical to assume that Blekko could potentially be missing some publishers. Additionally, the Blekko report includes some sites, like tinyurl.com, as having used the meta tag. In actuality, these sites are not. These sites are actually link shortening services. As a result, some overcounting could have accidentally occurred as well. Since Google refuses to release exact statistics, Blekko’s statistics are all we have to go on, and it is a safe assumption that they are fairly reliable. While we must say that the adoption could be off by a percentage point or two, but regardless, it is still quite low. Why Is the Adoption Rate so Low? Why would publishers chose not to use a tool that could potentially provide them with more exposure? As marketers, we know that it can be difficult to implement any new form of SEO, much less tagging in a new form. To make matters worse, Google chose to adopt a new, nonstandard form of tagging, rather than the traditional method of tagging. While traditional forms of tagging have offer a plethora of content management support, this new form of tagging does not. 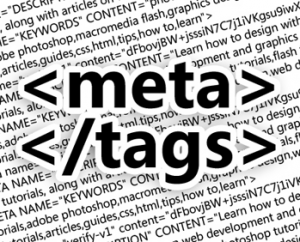 We would hazard a guess that one of the primary reasons why the adoption rate for this new meta tag is so low is due to the fact that Google has foregone standards in favor of creating its own new standard. It would not be difficult for Google to support both tagging platforms, and if they did, the adoption rate could increase significantly. So Who’s Actually Using the Tag? Going through the complete list, one can see that, while the number is low, the meta tag is being used some fairly big names. It will be interesting to see what happens with the adoption rate of the tag in the future and whether or not it will increase.